Open your inbox and there's probably a legion of emails not just promoting products but asking you to “Like” Facebook pages, “Follow” Twitter feeds and do all sorts of other social media stuff. Unfortunately, most email marketers fail at giving a legitimate reason why one should join yet another social media group, resulting in disinterest and a mostly unanswered call to action. 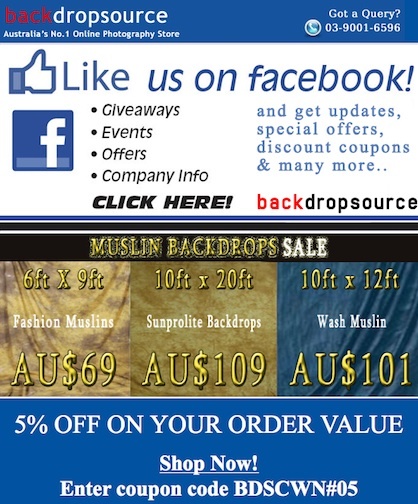 Backdropsource.com not only asks readers to “like” them on Facebook, but dangles multiple carrots like giveaways, special offers and event info to sweeten the deal. The staff at the Australia-based online photography store executes a brilliant social media drive in their emails, and hence wins our Best Social Media Promotion award. Each email from Backdropsource does two things. First, it promotes a sale, certain products, discounts and other typical email newsletter content. But equally important is the second part, where the company asks for Facebook likes. The Facebook section is not just above the fold and extremely prominent, it also gives subscribers multiple reasons in bullet point format to hit that button and expand their relationship with the virtual store. If you have a preview pane in your inbox and you're a subscriber, you just can't miss it, and it's an extremely persuasive way to get you on board. Before asking for Facebook likes, Backdropsource answers the question of “what's in it for me?” Thanks to this forward-thinking campaign, the company is a shoo-in for our social media award. For a look at Backdropsource’s full campaign, check them out in the Benchmark Email Community!